Join the Friends today by making an annual donation of just $5 for an individual, $10 for a family. Bring or mail the completed application form and donation to the Library. The Friends meet monthly on the first Thursday of each month at 7 pm in the Stafford Community Room at the Library. Meetings usually last just an hour and include updates on our current projects and activities. We’d love to have you join us! Can’t make it to the meetings? Stay connected with the Friends by liking the Friends of the Flat River Community Library page on Facebook or emailing FriendsOfFlatRiverCommLibrary@gmail.com. The Friends support the Library in many different ways. 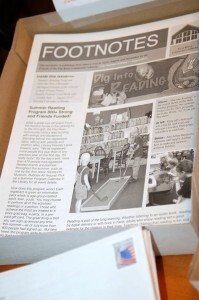 Activities include sponsoring Summer Reading, volunteering, holiday decorating, sending books to military personnel, sponsoring activities and events at the Library, and delivering “Books for Babies”, an informational package, to new mothers at the United Memorial Health Center. Stop by the Friends Shop, Books ‘n’ Things, located inside the Library near the Circulation Desk and support the Library by purchasing gently used books and other items. 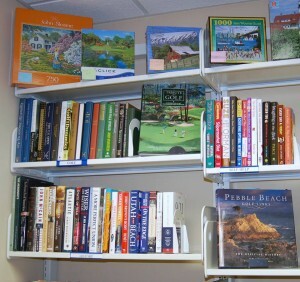 Open during regular Library hours, Books ‘n’ Things is stocked with hundreds of gently used hardcover and paperback books organized by category just like a retail store! After browsing sections of fiction, non-fiction, romance, biographies, travel, pets, collectible books, history, cookbooks, self-help, and more please take your selected items to the Circulation Desk to purchase. Check back often – the shelves are restocked several times a week! For even greater selection, visit the Used Book Sales! The Friends sponsor used book sales every Spring, Summer (during the Danish Festival) and Fall. Thousands of books are offered at each sale. Prices for paperbacks and hardcovers start at 25¢ each with most books in the 25¢ to $5.00 range. You’ll find books organized by category with tables for romance, cookbooks, children’s books, hardcover fiction, paperbacks, non-fiction and more. Income from the used book sales is used to support the Library! Contributions of used books are always welcome. Just bring donations to the back door or Circulation Desk of the Library during regular Library hours. We encourage the community to contribute books, puzzles, audio, and DVDs for these sales – recycling at it’s best! And, donations are deductible to the extent provided by law. Check the Library Calendar for dates of upcoming sales! The Friends publish a newsletter three times a year that is mailed to all Friends members and available electronically here.